^ Flood, Gavin D. (1996). An introduction to Hinduism. Cambridge, UK: Cambridge University Press. p. 341. ISBN 0-521-43878-0. Retrieved 21 April 2008. "Early Vaishnava worship focuses on three deities who become fused together, namely Vasudeva-Krishna, Krishna-Gopala, and Narayana, who in turn all become identified with Vishnu. Put simply, Vasudeva-Krishna and Krishna-Gopala were worshiped by groups generally referred to as Bhagavatas, while Narayana was worshipped by the Pancaratra sect." ^ Kim Knott, (1993). "Contemporary Theological Trends In The Hare Krishna Movement: A Theology of Religions". Retrieved 12 April 2008. ..."Bhakti, the highest path, was that of surrender to Lord Krishna, the way of pure devotional service to the Supreme Personality of Godhead". ^ "Monotheism (Stanford Encyclopedia of Philosophy) Nov 1, 2005". www.seop.leeds.ac.uk. Retrieved 26 July 2008. ^ "VEDA - Vedas and Vedic Knowledge Online - Vedic Encyclopedia, Bhakti-yoga in vedas, Library". www.veda.harekrsna.cz. Retrieved 4 May 2008. ^ a b Jan, Marez. "VEDA - Vedas and Vedic Knowledge Online - Vedic Encyclopedia, Bhakti-yoga in vedas, Library". www.veda.harekrsna.cz. Retrieved 4 May 2008. ^ Anand Karalapakkam, Bhakti List : Archives Wed Apr 19 2000. "krushNAstu bhagavAn swayam". 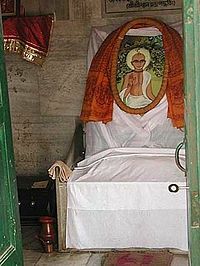 www.ramanuja.org. Retrieved 29 April 2008. ^ 1.3.28 Swami Prabhupada, A.C. Bhaktivedanta. "Srimad Bhagavatam Canto 1 Chapter 3 Verse 28". Bhaktivedanta Book Trust. Retrieved 7 May 2008. ^ "Sri Krishna". www.stephen-knapp.com. Retrieved 30 April 2008. ^ "VNN Editorial - 'Uttarayana', The Path Of Light And Darkness". www.vnn.org. Retrieved 3 May 2008. ^ Rosen, S.J. (2004). "Who Is Shri Chaitanya Mahaprabhu?". The Hare Krishna Movement: the Postcharismatic Fate of a Religious Transplant. Columbia University Press. ISBN 978-0-231-12256-6. Retrieved 19 April 2008. "he was given the ten-syllable Gopala mantra, a confidential incantation"
Delmonico, N. (2004). "The History Of Indic Monotheism And Modern Chaitanya Vaishnavism". The Hare Krishna Movement: the Postcharismatic Fate of a Religious Transplant. Columbia University Press. ISBN 978-0-231-12256-6. Retrieved 12 April 2008.